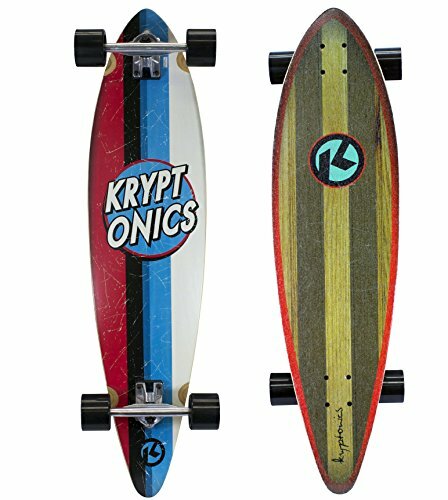 The Kryptonics 38-Inch Pintail Longboard Complete Skateboard is a great choice for any new or experienced longboarder who is serious about the sport. This board's 8-ply maple wood deck measures 38 inches long and 9.5 inches wide, offering excellent space for sure footing and enough room for both larger and smaller riders. An elongated pintail design delivers extra control and allows for easy braking. The deck features clear sand spray grip to securely hold feet in place and sports a detailed bottom graphic to give it a great visual appeal. Sail across the skate park, down the boardwalk, sidewalk, or street with the high-performance 69mm x 55mm poured polyurethane wheels with carbon steel ABEC-7 bearings that ensure a smooth, shock resistant ride - making it a fun and fit way to get around town. The 6-inch heavy-duty aluminum trucks, soft polyurethane bushings, and 12mm angled riser pads supply the enviable speed associated with longboards and make it able to sustain a higher weight limit than standard skateboards. 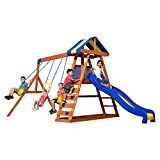 Recommended for ages 8 years and up, weighing up to 220 pounds.